I seem to start the week off well enough. And then it all pretty much goes downhill. Watch this space. Been feeling lately as if I’m in a slight limbo. This is a normal occurrence for me before exams (especially this semester with Joyce, Woolf and disclosure of confidential sources running through my mind), but there are also a number of reasons for this. Firstly, Inggs has been indulging in a bietjie kultuur and so she’s been quite scarce. Dit beteken min Stellenbosch. Secondly, I haven’t seen Lil in a while because I think her disgustingly huge bed has finally swallowed her whole. This means no verbal outlet. Thirdly, my couch at home is wack. This is just kak. As you can tell I’ve been neglecting posts of late and I’m “doing a Lynch” apparently by making these Monday ones quite frequent. What is an original idea anyway? Friday I was sick. That put pay to that. And then on Saturday I put on my brave face (it’s a hot face let me tell you) as the only single person at a close friend’s engagement party. Saving Grace: there was an open bar. Open. Bar. This in retrospect was not a good idea because I ended up doing Russian Bear shots with a guy who told me he was 27 but in actual fact was 17. These things are too serious to joke about. Plus I was seeing about 5 of him at the time so in my rational mind, their ages combined made it okay. Thank god for the boy’s father who came to usher him away, but not before raising a disapproving eyebrow at me. Sugar mommy, tick. So apparently the aKING CD launch was quite good. I ended up at Stones in Tableview. These things again, are too serious to joke about. But there were a few naughty people who provided me with ample amusement, so I guess it was worthwhile in the end. Oh and I heard the Ataris gig was quite good too. I wasn’t there. Engagement party/Sugar mommy escapades. Must hop to it and finish that feature article due tomorrow. Don’t have a topic yet. 1500 words here we come. 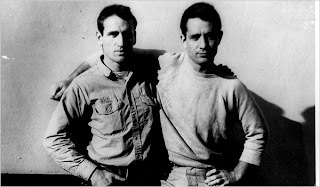 Neal Cassady was not born in the backseat of a car (or any other vehicle) stopped by the roadside on the outskirts of Salt Lake City in the early hours of February 8, 1926 That was one of the many romantic inventions that Neal fed Jack Kerouac many years later, fabrications that were unquestionably accepted by the captivated author and woven into the legend of the charismatic Dean Moriarty, Cassady’s alter ego and the hero of On the Road. – David Sandison, Graham Vickers from Neal Cassady: the fast life of a beat hero.